I began my professional career as a sub-district and district level administrator in India-a position that makes one responsible for pretty much everything- from making sure the water comes out of the taps and the garbage is collected in the morning to helping pull accident victims out from horrific accidents and facing down stone-pelting mobs. This early experience of being thrown into the deep end of the pool gives me a somewhat pragmatic sense of perspective and equanimity. But I still recall the horror and overwhelming grief that I felt when the full impact of the 2004 Tsunami started becoming clear. 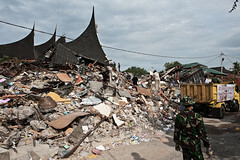 In Indonesia alone approximately 220,000 people lost their lives. Apa yang Anda lakukan kalau ada kapal seberat 2.600 ton mendarat di dekat rumah? Percaya atau tidak, ada beberapa orang yang bingung menjawab pertanyaan ini. Tsunami yang menyapu Lautan Hindia pada 26 Desember 2004 tidak hanya membawa kerusakan dan korban jiwa. Kejadian tersebut juga menyapu PLTD Apung 1, kapal pembangkit listrik yang bersandar di Pelabuhan Ulee Lheue Banda Aceh, naik ke darat. Seharusnya kapal ini menghasilkan listrik untuk beberapa dekade lagi untuk mengurangi keterbatasan listrik di Indonesia. Tetapi kapal tersebut terangkat oleh tsunami hingga beberapa kilometer ke darat, tepat di tengah-tengah perumahan. Ketika saya pertama kali tiba di Banda Aceh pada tahun 2006, penduduk masih tinggal di beberapa rumah tepat di samping kapal itu. Sebuah jalan sementara dibuat mengelilingi benda besar tersebut. Di dekatnya ada kotak yang diletakkan di atas sebuah kursi, dengan tulisan tangan untuk meminta sumbangan bagi para korban tsunami. Pertanyaan yang ada di benak kami semua adalah: Apa yang akan mereka lakukan dengan sumbangan itu? What do you do when a 2,600 ton ship ends up in your neighborhood? Believe it or not, there are people who’ve had to struggle with this question. The tsunami that swept across the Indian Ocean on December 26, 2004, didn’t only leave behind wreckage and corpses. It also left behind the PLTD Apung 1, a power-generating barge that was docked in Banda Aceh’s Ulee Lheue port when the disaster struck. It might have pumped out electricity for a few more decades, easing electricity shortages throughout Indonesia, before heading to the scrap heap. Instead, it was lifted by the tsunami and deposited several kilometers inland, smack in the middle of a residential neighborhood. When I first arrived in Banda Aceh in 2006, people were living in houses right next to it. A makeshift road worked its way around the massive obstacle. A box sat on a chair nearby, with a hand-written sign asking for donations for tsunami victims. The question we all had was: What on earth are they going to do with it? My first trip to Aceh was in August 1998, four months after the resignation of former President Soeharto. It was the height of Indonesia's pro-democracy Reformasi movement, and many journalists thought that travel permits were still required, as it had been for decades. My friend and I were venturing as 'tourists'. In many villages, the legacy of repression remained: razed houses, shuttered schools, and households run by widows. Poverty was unavoidable; violence and economic growth are often incompatible. Explaining the housing program admistered by the Multi-Donor Fund to a group of residents. (Geumala Yatim, who started working with communities in Aceh soon after the 2004 tsunami hit, is writing a book about her experiences there. This is adapted from one of its chapters). At the time, I was at my friend Oscar’s house, getting ready to attend a Christmas party at another friend’s house. Oscar asked me to turn the TV on to CNN or BBC. “I heard there’s a big natural disaster somewhere on the tip of Sumatra. Aceh probably. Not sure,” he said. Up until we left the house, both channels were relaying non-stop reports on natural disasters in Thailand and Sri Lanka. No reports on what was happening on the tip of Sumatra thus far.